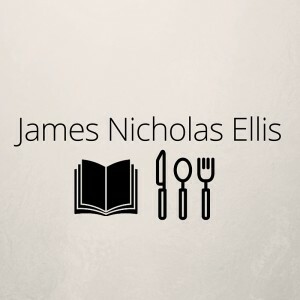 When he is not in the kitchen or eating out, you can find James Nicholas Ellis visiting local bookstores, attending readings, and working on his creative writing at home. He is a voracious reader, and his favorite authors include Stephen King, Paulo Coelho, Anthony Bourdain, and Ernest Hemingway. He is always looking for new book and author recommendations, and he enjoys discussing the writing and creative process with other writers and artists. His dream is to publish his own books one day. Ellis enjoys studying the cookbooks and recipes of chefs such as Jacques Pepin, Alice Waters, Mario Batali, and Lidia Bastianich, and is currently studying the foundations of classic French and Italian cuisine to master the basics of the two great culinary traditions. He enjoys making hearty pasta dishes and roasts, and grilling in the summertime for his family and friends. One of his favorite things about cooking is the joy and sense of closeness and togetherness it brings to everyone around him. James Nicholas Ellis enjoys traveling to major cities such as New York and Boston to eat at his favorite new and old restaurants. He goes to restaurants not only for entertainment and great food, but to learn and gather new ideas for his own kitchen from talented chefs.